While at Walmart the other day, I quickly ran through their new-again fabric section. Can we all collectively say “yay!” for Walmart bringing back the fabric department?! Anyway, I was about to walk out (I was of course shopping with the boys again and they had already had enough), when I spotted this purple and red chiffon print peeking out of a pile of colorful fleece bolts. I grabbed it to check it out really quick and loved it even more when I unrolled it a bit and saw the lovely native american-esque pattern. I know. I’m sort of becoming obsessed. It kind of had the same feel as my maxi dress I just did (and LOVE) and when I saw that it was only $1.50 a yard I HAD to have some. I didn’t know what I was going to do with it, but I got 3 yards and went on my little way. 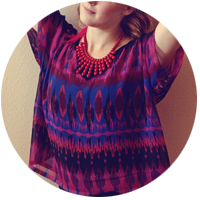 Cost: $1.50 (You only need about a yard of fabric for this shirt so check remnant bins to get some great chiffon for CHEAP). About a yard of chiffon fabric (or other lightweight drapey fabric that you love). 1. Refer to my little sketchy plan below. It basically shows how to do it. 2. Here are some extra tips. TIP 1: BE CAREFUL! Chiffon is delicate and tears and frays very easily. So be slow and steady when feeding it through the machine. 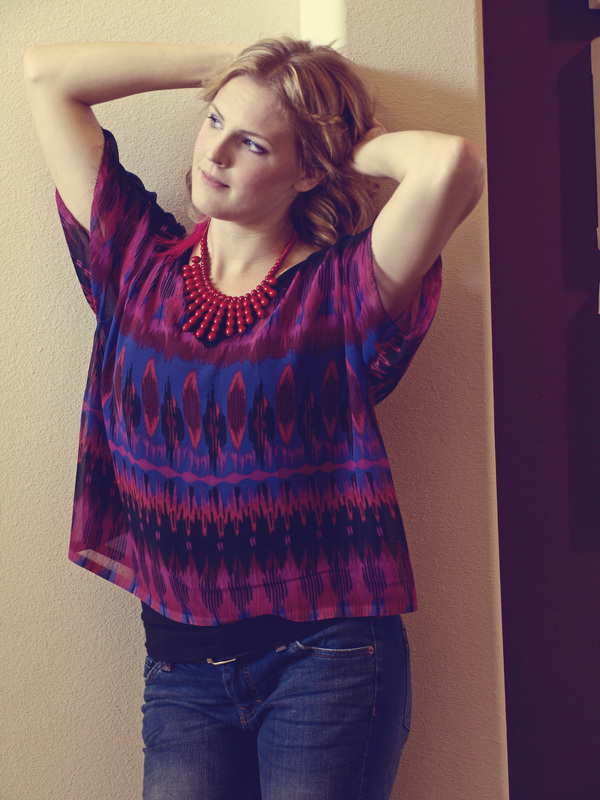 TIP 2: I used the finished edge as the bottom of my shirt so I didn’t have to zigzag the bottom. 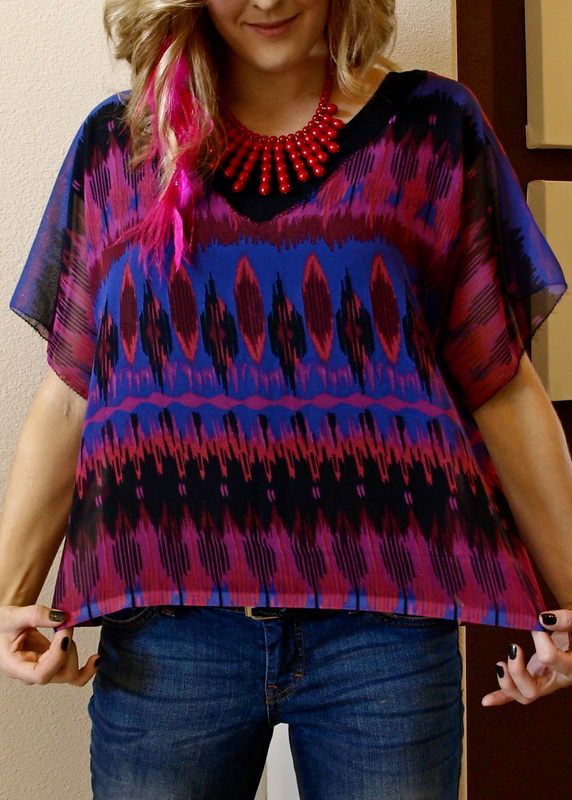 If your chiffon piece has a finished edge, utilize it to save you time. TIP 3: Don’t forget to zigzag stitch (or serge if you have a serger) the INSIDE seams as well as the outside raw edges so they don’t continue to fray. And thats it. This took me less than 30 minutes to throw together. And I’m pretty happy with it. :) What do you think? You can make this. And its great for FAT days. P.S. I also made the red necklace and the pink clip-in hair extension. How did you finish off the neck? I simply did an overstitch around the raw edges to prevent them from fraying. 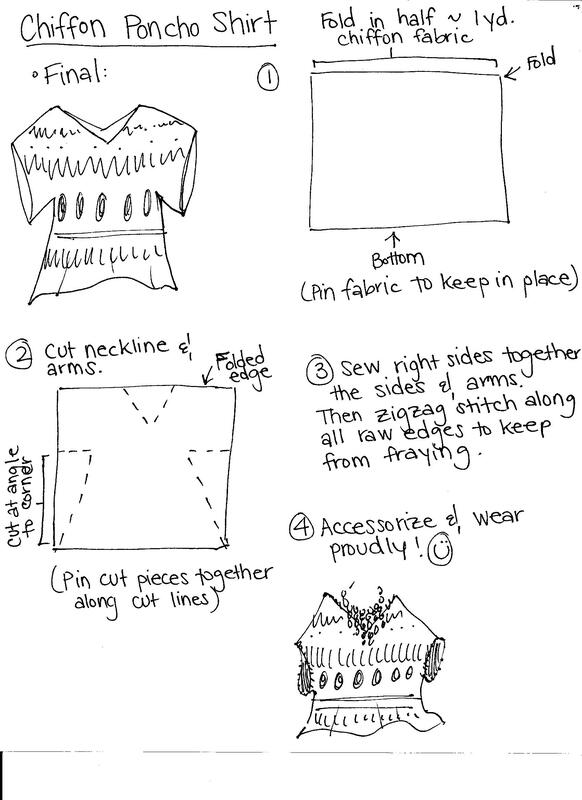 You could also do a small rolled hem.